Learn how to fix bikes with specialty bike tools! 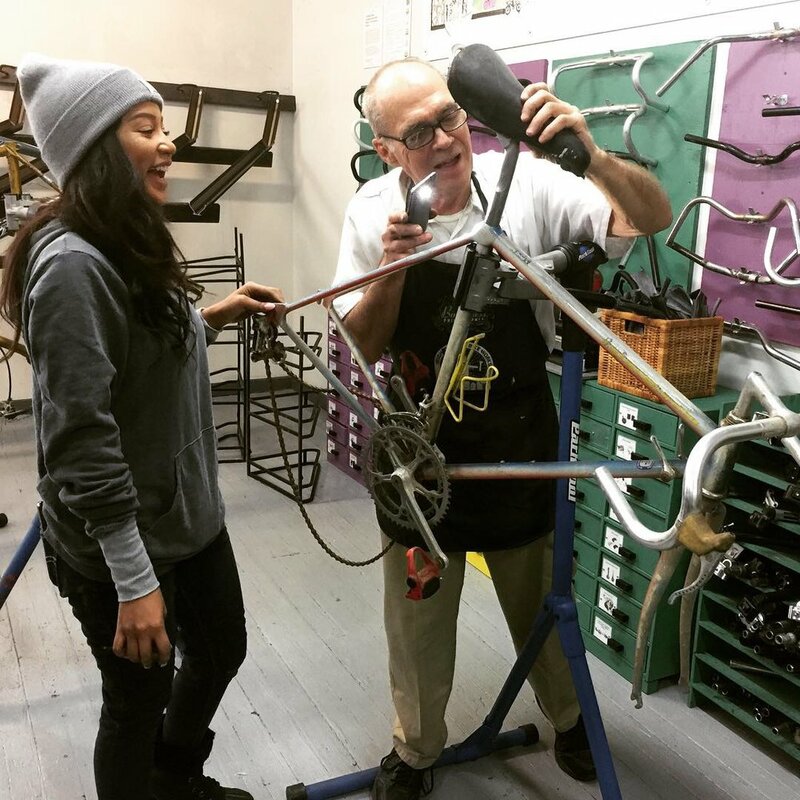 In our Earn-A-Bike class youth learn the basics of bike repair and maintenance by fixing up a bike that has been donated to Neighborhood Bike Works. At Earn-A-Bike graduation, students are able to keep the bike they've refurbished and they can also bring home a lock and helmet. Additionally, the class includes lessons on safe urban riding, health, and nutrition. All graduates of the Earn-A-Bike program can continue to work in the shop, earning hours they can trade for more bikes, parts, and accessories. Graduates also get the chance to participate in our many advanced level programs. Earn-A-Bike is free and open to youth ages 11 - 18. Ride Club is a four-week after-school program that enables youth ages 8-12 to explore Philadelphia by bike! Through group rides, youth explore natural, historic, and artistic spaces in West Philadelphia. Ride Club emphasizes bike safety and rules of the road, along with the joys of bicycle adventure. Youth will ride on Philadelphia streets and use Circuit trails and bike paths that are connected to initiatives such as The East Coast Greenway and Get Active 58! Ride Club curriculum includes lessons on health, fitness, and on-the-road bike repairs. All Ride Club participants should know how to ride a bike and must be able to ride 20 minutes without a break. Neighborhood Bike Works can provide youth with a bike and helmet to use during rides. Rides vary between two and six miles per day, and will also vary based on the ability of youth in the class. Ride Club is free. After completing Ride Club, youth have the opportunity to participate in Neighborhood Bike Works' graduate programs. To graduate, each participant is expected to attend 75% of classes. The first four classes are especially critical to students' success! Wrench Squad programs are for youth who have graduated from Earn a Bike or Ride Club. Youth in our Wrench Squad work on repair projects during our drop-in shop time, participate in group rides, learn leadership and advanced mechanics skills through workshops, field trips and self-paced skills badges, and can qualify for apprenticeships. Fix your bike! Saturdays are open shop sessions to continue learning and practicing bike mechanic skills. Students can continue work on the bike they've earned, begin work on a new project, or help with tasks around the shop to earn additional credit hours (which can be used to purchase new bikes, parts, and accessories). Drop-In runs from Noon - 4:00PM on Saturdays. Bicycle Coalition Youth Cycling (BCYC) fosters healthy habits, independence, and leadership, one ride at a time. By joining Team NBW, youth learn about teamwork, perseverance, and goal-setting. Participants develop their skills in racing their bike, try their hand in a Time Trial and Criterium race, ride places they’ve never been before, make new friends with young cyclists from other teams, and learn more about bicycling in Philadelphia. Team members use a racing bike from BCYC and will be given some basic race team gear and accessories. BCYC is made possible through a partnership with the Bicycle Coalition of Greater Philadelphia. Spring program is March 11 - June 4, with practice on Mondays and Wednesdays from 4:00 - 6:00 PM. There will also be events on several Saturdays. Explore Philadelphia parks, watersheds, and green spaces! Ride a mountain bike on some of our region's best bike trails! Freedom Riders is for youth 12 to 18 who have finished either Earn-A-Bike, Ride Club, or NBW's Summer Camp. This is a ride program where we'll explore Philly's green-spaces and watershed areas, with an emphasis on learning about our watershed environments and enjoying all the sights, sounds, and bike trails they have to offer. The next Freedom Riders class is in Fall 2019. Paid apprenticeships are available as an assistant instructor, in our shop and building bikes in our Winter Bike Build. The NBW Youth Council serves as the youth voice of NBW. This core group of leaders can offer fresh programming ideas to NBW staff and their peers. Youth Council members are also deeply involved in the national Youth Bike Summit. If interested in finding out more, or joining the Youth Council, reach out to a Youth Council member or Director of Youth Programs, Lula Defersha.